Communist architecture pin-up tower. Genex Tower or “The Western Gate”, Novi Beograd, Serbia. “They haven’t changed a thing here. Nobody has spent any money on this place in 40 years.” Given that my new Serbian bar-owning friend was pouring free drinks, and was actually complaining that the place hadn’t been spruced up since 1976, I kept my communist architecture loving opinion to myself. He just didn’t realise we were lounging in what will undoubtedly be a future Hollywood movie set, inside a building that would bring any lover of communist chic to their knees. Nobody quite does architecture, design, and city planning, quite like ex-communist nations. Is “communist chic”, the illusion-filled products of the glory days of communism, ripe for a glamorous new takeover of the Western wallet? If they play their red-cards right, New Belgrade – the mind altering planned socialist city across the river Sava from historic Belgrade – is in prime position to be ground zero for the next rehash of the cultural revolution. With a familiar blueprint, “Novi Beograd” was born from the ashes of World War II. Conceived as the new capital city of the benevolently named Federal People’s Republic of Yugoslavia, the new communist government spared little time in converting a marshy no-mans land into a symbolic socialist utopia. It was a time of a tremendous optimism. Novi Beograd represented a completely clean slate, in more ways than one. A radically modern, centrally planned city, worthy of representing the ambition, power, and the impressive concrete pouring ability of the burgeoning communist state of Yugoslavia. Town Hall, Novi Beograd, Serbia. Architects Stojan Maksimovic and Branislav Jovin. Stunning communist-era architectural design. Sava Centar, Novi Beograd, Serbia. Architect Stojan Maksimović, 1979. Future movie set, without doubt. The heart of Block 23, Belgrade. Communist architecture and urban planning on a monumental scale. Museum of Aviation, Novi Beograd. Architect Ivan Štraus, 1988. 25th May Sport Centre, Belgrade, Serbia. Just across the river from New Belgrade. Architect – Ivan Antic, 1975. The scale of Novi Beograd’s “Blokovi” neighbourhood system becomes more apparent looking down from 30 levels above. Another angle of Blok 62, one of the most impressive communist-era architectural sites of Belgrade, Serbia. Although Belgrade, capital of modern day Serbia, is geographically just a stones throw from Novi Beograd, the two cities are utterly opposed in disposition. The communist era architects and town planners built Novi Beograd with a ruthless lack of sympathy towards the old historic core of Belgrade. Classical and elegant – versus brutal, exacting, and autocratically monumental. Down to it’s name, the new Belgrade was designed and planned to be absolutely contemporary. For an outsider, Novi Beograd is surreal. Although originally conceived largely as a communist administrative center, Novi Beograd has eventuated primarily as residential housing. Western surburban-ites, you will need to adjust your definition of “housing”. Street by street, block by block, it’s a relentlessly repeated planned system – an immense and efficient concrete jungle, housing the largest number of residents of any municipality in Serbia. The enormous scale of “Blokovi”, the fitting name given to the urban neighbourhoods of Novi Beograd, is difficult to exaggerate. Blokovi is a programmatic communist construction effort that took place over decades, one block after another, each one holding often more than ten thousand residents. Although the architectural style of the blocks differed as new design trends emerged – the planned intent was maintained – provide housing, and create a showcase of mass-produced large scale brutal communist architecture. Despite the ironic and nostalgic appeal to a naive Westerner, Blokovi shows clear signs of dysfunction. Decaying raw concrete skyscrapers with severe maintenance issues and wide-spread vandalism, sit alongside abandoned buildings. Sounds like my kind of place, but despite the high density of residents, a distinct feeling of isolation prevails. But perhaps it’s not the brutal communist architecture that is at fault. It may be Novi Beograd’s city planning, not the buildings, that is to blame for many of these issues. Organising of a city into distinct “precincts” is an urban planning methodology proven to be fraught with difficulties, and conducive to sterilisation of a city. We humans tend to enjoy a metropolis where cross-pollination of our daily activities and movements leads to random sights and encounters, unexpectedly occurring from moment to moment. Easy to experience in a city that grew out of organic randomness, much more difficult in a pre-planned city where zones are designed for efficiency above all else. Phillipa and her Pigeon friend “Staunchy” investigate the heart of a truly enormous communist era building in Block 23, New Belgrade, Serbia. The Sava Centar has more floor space than the average 50 storey skyscraper, and yet is only several levels tall. An icon of communist architectural ambition in New Belgrade, Serbia. Communism and concrete – a love affair. Novi Beograd, Serbia. This building is 100,000 square metres. Just multiply this view by one hundred. Sava Centar, Novi Beograd. Blokiva at ground level, Novi Beograd. Triangular concrete in the snow, a Belgrade nod to Novi Beograd. Serbia. I’m standing a long way back from that building, with quite a wide camera lens. It’s huge. Novi Beograd. Colour photos, or black and white? Either way, communist architecture doesn’t care. Blok 62. Communist architecture of Novi Beograd, Serbia. Blok 62, Novi Boegrad. A fine example of communist architecture and city planning. As an outsider exploring the once public-domain city of Novi Beograd, it’s easy to be wide-eyed and superficial about this otherworldly sci-fi styled spectacle. No, I didn’t grow up with Communism. Despite my fondness of brutal and modernist architecture, I have no concept of what that would be like to actually live in Novi Beograd. Perhaps “you had to be there” is a fair comment. However, I’m not alone, there is a huge fascination from the West, with all things Red. From Che Guevara appearing on babies clothing, to the “Hope” Obama campaign poster designed by Shepard Fairey (an artist known for co-opting of communist stylings), through to a countless number of discretionary spending trinkets featuring iconography and distant communist abbreviations like USSR and CCCP. The West expresses it’s capitalistic love of a communist nostalgia they have never actually known. People in the West were once bombarded with government propaganda about “the red devil”, and the inherent evilness of communism. Now, with the global decline of communism, the reigns have been handed over to savvy marketers, hoping to exploit this memory into a profitable trend. However, as with all remembered era’s and cultures, the blurring between the imaginary memory of communism, and whatever the reality of living with communism was, will only continue to get fuzzier. Yes, you had to be there. But, I wasn’t. Maybe I would have loved it. Maybe, as a 1980’s teenager of communism, I would have dreamed of visiting stereotypical examples of “capitalist” architecture and culture, like McDonalds or Pizza Hut restaurants. But today, I did explore the impersonal metropolis of Novi Beograd, Serbia. And, seriously, this communist architecture is really cool. PS, lovers of this style of architecture, check out the articles on Novi Zagreb Croatia, Skopje Macedonia, and Bratislava Slovkia. Great photo of the Redex Tower in Serbia.Communist architecture on the whole always seem grey and dreary.The heart of block 23 Belgrade is a bit surprising, They had playgrounds? Thanks Lyn. Block 23 had playgrounds, and what appeared to be two different schools, as well as various businesses such as a small market, and a hair salon, in the large “courtyard” area (for want of a better word). A mixed-use arrangement is common. Block 23 still has the playgrounds, the elementary school and the kindergarten. Btw, amazing shot of the Genex tower. Excuse my poor grammar, of course I should have wrote “has”. Thanks Dachaz! Thanks Lyn – as I’m travelling, I don’t always have the luxury of being where I want to be at the right time of the day for photos, but I got lucky with Blok 62 – the light was perfect. its “genex-tower”, not “redex-tower”. genex is/was a company. besides that, there is/was a restaurant and even flats for the average joe. i can recommend EVERYONE who likes brutalism or communist architecture in belgrad to visit the eastern gate in the neighbourhood “konjarnik”. this complex is special to me, even if i dont like to go there, because its a very dangerous ´hood, especialy after dark. the buildings inside looks like in a new-york-ghetto-film from the 80ties. Thanks for the info Milorad. I saw the Eastern Gate from my bus window as I was leaving Belgrade…. beautiful! There are a lot of playgounds. I am from Bulgaria and the architecture is very similar. There are usually communities with several buildings, and between them there always is something like a small park. On the outside street, then buildings and usually between them there are trees, alleys, playgrounds and benches. Often there are pink-pong tables and just places for outdoor activities. Unfortunately after the change to democracy, the new government was extremely corrupt and all these facilities were not maintained at all. They started slowly disappearing and now there are mostly ruins left. The buildings are also in much worse state. They used to be re-painted every 5 years. Usually in some bright colors, however now the paint is falling apart and everything looks like it came out of post-apocalyptic horror movie :( . Glad to see you back! This place is several hours north from where I was born and raised! Cheers mate… excellent, you’re Serbian. What an incredible country, very much enjoying myself here. I wonder if it still looks so stark on a sunny summer’s day? Or if the streets are imbued with a vibrancy that doesn’t exist in winter? I’m sure it would look just as stark in Summer – you can see from the first photo, one of the days I visited Blokiva it was nice and sunny. I’m not sure about the vibrancy, I’ve been told that Belgrade is a different place in Summer, so maybe Novi Beograd is as well. That having been said – Belgrade is petty vibrant, even now in Winter. On a summer’s day the blokovi are HOOOOOOOTTTT – 40 degrees C, lots of asphalt and concrete, not a ton of shade… you can imagine. But I wouldn’t say it’s “stark,” although it may take some getting used to for some. Hi Katie… I can only imagine! Personally, I think the Blokovi look amazing. My kind of suburbs! Great blog. One of the freshest, non-pretentious photo-writers in a long time. Keep ’em coming bro. Very kind words Ray, thank you. I will keep em coming. LOVE some of those images. I’m a real sucker for architecture photography, and some of these are amazing! There’s something so pleasing about the organization of communist architecture – they really tried, didn’t they? But now it just looks so sad and derelict. Thanks Linda. The buildings are certainly looking a little run-down these days, but remain absolutely fascinating. This is a fantastic post and your photos are amazing! Thank you so much – you transported me behind the former Iron Curtain. It really is as if the buildings are from a futuristic movie set. Do they also have old trains from the communist era with communist signs everywhere? And it feels as if it is going to drive back into a post-war era as soon as you see the train coming to a halt (although the train s surprisingly “modern” on the inside). Hey Mireille – totally agree, it is like a futuristic movie set. The trains, well some are old, and some are really modern. It’s quite a juxtaposition. Prague, Bratislava, Plzen- filled with buildings that showed formal solutions hard to find in the West. Can’t take away the grimm atmosphere of he streets, though. Hi Pedro, thanks for your comment, what a great opportunity you had visiting Eastern Europe, whilst studying architecture. I know a lot of architects are fascinated with this part of the world, and understandably so. Look forward to seeing you around here, you may have noticed I have a thing for architecture! Fantastic article and your photos seem to have captured the scene beautifully (I haven’t been but I can feel the oppressive grey buildings bearing down on me!). They still look cool though and I can definitely see them in a movie set! Thanks Victoria, really appreciate the compliment. It’s just so obvious that this is a movie set, right? Fantastic blog!! I plan on travelling to that part of the world and Im absolutely fascinated by the brutalist architecture. Do you have a list of must see spots? 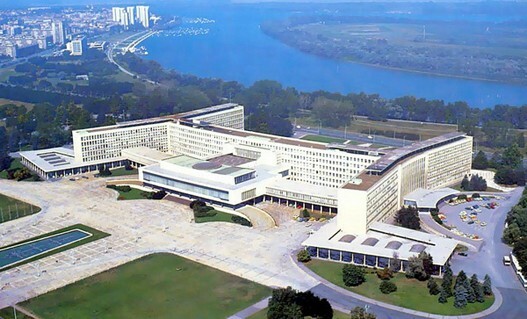 Ive heard that the SIV building in New Belgrade is absolutely amazing. Hi Peter (from a fellow Australian). I don’t have a list, just head to Novi Beograd, you can’t go wrong. The SIV building is hugely impressive, on a grand scale. Communist architecture at it’s largest! Ok, I’m now officially caught up on all your posts. My OCD kicks in and I have to read oldest to newest. Just mind boggling this city and all that concrete! Just makes me think of post-apocalyptic movie scenes. But you’re pictures somehow bring out their unique beauty and interestingness (I know that’s now a word, but I’m using it anyway). Looking forward to what you bring us next. haha… now I just need to catch up on replying to your comments, Noelle! 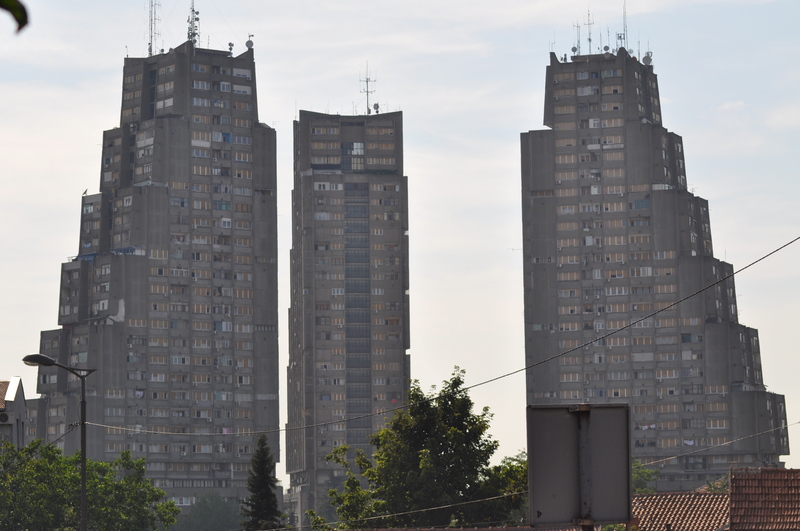 Belgrade really is a mind boggling city, Novi Beograd in particular – I’ve never experienced anything like the concrete neighbourhoods of Blokovi. It’s a strange place – as you say, a totally appropriate setting for a post apocalyptic movie, but on the other hand, still very much a community where people live, learn, and play. I’m really glad I got to see it all. Hi, I like your article, and definitely cool photos. On some “structural” points: Novi Beograd (New Belgrade) and Beograd (Belgrade) are not two different cities. New Belgrade is one of the municipalities of Belgrade, from total of 17. They all have the same basic postal code, with a few figures different to specify the municipality. Similar structure is quite common for European capitals that were important in socialistic, socialist and post socialist times. The fun is in the prestige – some of these blocks were The places to live at the times they were new. Some still are. Hi Blanca, thanks for the clarification. In the city where I am from, the different municipalities refer to themselves as “cities” even though they are all part of the one city. Hence my use of the term. I can only imagine what these blocks were like when new, and I for one would be happy to live in many of the blocks today – the apartments look fantastic in my opinion, and I’m a big fan of the way they are often laid out around schools, shops, open spaces, and public transport. I’ll be in Beograd in ten days and looking forward to stare at those concrete beauties! There’s a lot of fans of communist-era brutalism Elenaccia! You will LOVE Beograd, there is so much to see. Thanks Marko…that’s a really interesting group, I’ll be following along. Thanx for nice pictures and kind words about our capital city. I just wanted to add something about your prediction of ‘future movie sets’. There is movie (with Luc Besson) already filmed there. The movie is called “District 13” ( http://www.imdb.com/title/tt0414852/ ) (with stunning shots and scenes of New Belgrade from garage level to aerial view. There are also many parkour scenes, so you might find it interesting to see. Thanks SL – I will try and check that movie out. As for visiting again…I already miss Belgrade, and am certain I will be back. That first photo is an OMG moment. And those last pictures are a combination of both. Looks as if the city was built in Minecraft haha. I saw these photos of communist-era buildings that had been creatively splashed with colors and it completely changed the feel of the architecture from a bygone era to modern feel. Sitting in a Blokovi enjoying your blog, I’ve mixed feelings about the architecture. It seems like a 1950s sci-fi movie, all kinds of wonderful and peculiar however, the government really need to help maintain the buildings. I am surprised by the lack of vandalism compared to the number of people who live here, everyone seems to be cleaning and fixing their apartment day and night but I think it’s hard for inhabitants. Oftentimes there are so many people in small apartments, whole families, and extended families in one bedroomed apartments if they are lucky. There are plenty of amenities, albeit sadly neglected and poorly maintained – which is unfortunately the order of the day in Serbia. The Ada Ciganlija is a wonderful public amenity close to New Belgrade and provides much needed respite from the unforgiving concrete jungle, particularly in summer which is unbearably hot in the blokovi. The architecture may be worth a visit but I feel Serbians deserve so much more than relics of a bygone time, something that offers a hope and freedom. Hi Spud, I am back in Belgrade today as well, and yesterday, took another visit out to Blokovi (Blok 70 – great Chinese food). You’re right – these buildings should be maintained. And the buildings also give me mixed feelings – but most of the locals I talk to think that Novi Beograd is a nice place. I’ve been inside one building a few days ago, it was a top-floor apartment split over two levels, with just two people living there (mother and son). They were happy, and veyr proud of their home. Hopefully, I’ll get to see inside some more, and talk to some more residents – to get a better overview of just how people feel living in these apartment blocks. I think these buildings are cool or fascinating only if you don’t have to live in there. But yes, they’re really fascinating to be watched. Hello there! Those are some pretty stunning pictures! Overall, I’ve seen some pretty amazing architectural designs from Tito’s Yugoslavia such as these. Really a shame that some of them are just left to decay. Would you happen to know if there are any materials/books on the style and architecture of East European, Communist buildings? Also, I would like to know if I may ask for your permission to use some of your photos as a backdrop for a game (that also doubles as a university project) I am working on. If there’s any further info you’d like to know, please tell me and I’ll be happy to oblige ! Hey Bogdan – feel free to use the photos as backdrops on one condition – please give me a copy of the game when it’s done! (even when it’s half done!) I’d love to see my photography show up in that way. As far as books – I have come across a book on Communist-era architecture from the USSR – I think the book is called CCCP – you should find it easily enough. But I’ve never seen one on Eastern European or former-Yugoslavia. It’a a huge undertaking to do a book like that – I’m taking hundreds (if not thousands) of photos, and one day, time permitting, I will sit down and put them all together in book form. But, don’t hold your breath waiting. At the moment Novi Beograd is seen as one of the ‘cool’ and ‘happening’ suburbs of Belgrade, so definitely a sought after place to live. Love the photos and love your recommendation of Belgrade for 2014 must see city. Respect for these truly wonderful pictures! Also respect for showing the world some of the beauties Belgrade and Serbia in general have to offer! I was also quite amazed to see photos of my own neighbourhood. Maybe you’ll be intersted to know there were many Yugoslav/Serbian films made in Novi Beograd. Those made back in the communist-era portrayed Blokovi as a booming, new place, still under construction (“Rad na odredjeno vreme”, “Pavle Pavlovic”, “Lude godine 2”), while those made after the collapse of communism and breakup of Yugoslavia portrayed them mostly as a decayed, dangerous place (“Rane”, “1na1”, “Apsolutnih sto”, “Ljubav i drugi zlocini”). It’s quite interesting to compare the differences in the image Novi Beograd once had and know has. Fortunately, a lot has been done to improve Novi Beograd’s infrastructure (although it may not seem so at a first glance) and many companies decided to (re)locate here to one of many new Western-style glass buidings, so one can say that, in last couple of years, Novi Beograd has truly become the business-center of Belgrade. Lived in Blok 63 for over 25 years. Did you know that buildings in blocks 61-64 are called Panonian Ships? A friend sent me link of this article, knowing how deeply in love I am with New Belgrade and everything attached to it, especially architecture. As an PhD student, architect and born and raised on New Belgrade, I am interested in how other people (especially foreigners) react on it. That is why your article was very interesting to me. Also, I have done some research on Sava Center, which you mentioned several times, so take a look at my article (http://pedjamarkovic.com/sava-center-linking-architecture-and-politics) and maybe it will throw some new light on your thoughts. Feel free to contact me. Thank you so much Pedja! I will more than likely contact you soon… I have a project in mind. Nice to hear that, can’t wait to hear what it’s all about. I live my whole life in one “”tv set”, it is a great place to live, great building, and block is very well designed, with plenty of green, parks, small artificial hills for kids to sled in winter…. The best part are the windows. Big concrete frame never lets your window get wet in the rain, or during snowstorms… I really love the facade, it is made of river stones, yellowish and brown, it looks the same as day it was made. I think it was great growing up in that socialistic environment, and with all those symbols and architecture. Those buildings may look dull in the winter, or in the rain, but in the sunrise, or in the lazy summer afternoon, they seem like from another, lost dimension, where Moebius is in charge for design. That kind of architecture is “home” for me. I would never want to live anywhere else. Sad is that the city is not maintaining those buildings, but to be honest, the city is not maintaining any, except the ones in core center. Same goes for whole blocks, decades of poverty left their mark in graffiti and garbage…. Thank you Anika! The good news is, I’m still in Belgrade (I can’t escape this city), and will head out to Blok 28 in the next few days. I have a feeling I’ve seen the “TV Sets” in passing, but I’ll have to take a photo and add it to this article. I’m very jealous of where you live! (I’m over in “old” Beograd for now). Thanks again for your comments, I really appreciate hearing from locals, giving their feelings and opinions about Novi Beograd. I DISAGREE WITH THE WORD COMMUNIST only! That kind of architecture DOES NOT EXISTS! Do you make me to believe that CAPITALISM ARCHITECTURE exists? This is not true! Exists only BELGRADE ARCHITECTURE in period of YUGOSLAVIA, thats only correct! Yes, that is very true. Of course, there is also “religious architecture”, despite that the architects may not have been religious. As I have said in my other articles, on this website, “of course there is no such thing as communist architecture”. Many people from non-communist nations will refer to this architecture as “communist architecture”. As Milena says in these comments, the architecture may be known as “Social Realism”. 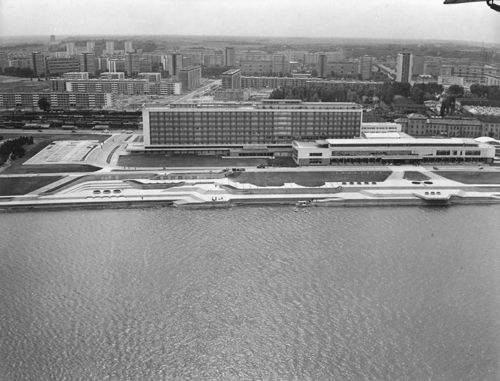 I would also add, it’s known as “modernist” and “brutalist” – but you know what, if I didn’t use the words “communist architecture”, so many people would have never read this article, and so many people would not have seen the brilliant area and design of Novi Beograd. Dear Nate, thanks for the great photos and your honest, sympathetic opinion on New Belgrade. As someone who spent most of her life in various parts of New Belgrade, I never really liked it. Blokovi especially seemed very “claustrophobic” to me, despite their size and plentiful free space. It is only when I became student of architecture that I learned some nifty things about New Belgrade and other, as you call it, communist-era housing. Those buildings were designed to offer best possible comfort to their denizens, offering sunlit, aired spaces with reasonable sq.m per person and plenty of green spaces and basic utilities. More so than most other parts of Belgrade. And when I entered an 8th floor apartment and realized that there.is.a.view, across river and over hills, with so.much.green within the blocks, I changed my opinion. New Belgrade is much, much better from within! Everything you wrote is on point, especially the bad sides, but all that housing was a mixture of need to house, for.free, a massive influx of former country population, a socialist take on modernist and international style, and a Chandigar-like experiment. And another note: the architectural style is officially called “Social Realism”, not “communist architecture”. We were, after all, non-alignment socialists. Cheers, mate! I’ve just come across this article, and it’s amazing to me that I pass by these buildings every day and have never seen this beauty in them which you managed to capture and relay to all of us. Thank you for that. Photos are great. It is interesting to see how people from other countries see our concrete. Piece of concrete, deep in the heart. Also great web presentation with everyday life- images ”in colour”. I’m an American living in Blok 61. From the outside, my neighborhood looks like the worst sort of slums in New York. I expect muggers to leap out at any moment. The buildings are in poor repair, the grassy areas unmowed, the litter piled up where the wind blows it, and the whole area occupied by bands of feral abandoned dogs and cats. But my building’s parking lot is full of new Fiats and Peugeots. The apartments are quite nice inside. And my eight-year-old daughter ranges freely and safely through the playgrounds that are scattered at the bases of the buildings. Within a three-minute walk are five bakeries, two supermarkets (Maxi and Idea), two 24-hour pharmacies, three bank branches and at least six ATMs, a post office, three cafes, three rostilj (Serbian ethnic barbecue) joints, three sit-down restaurants, a small seven-days-a-week farmers’ market, and four 24-hour convenience stores. Life here is strange and not entirely comfortable for someone raised in America, I’ll admit. But parts of it are very nice. I love your photos. You captured the soul of the place. You’ve just got one thing wrong there. Yugoslavia was not a communist country. It was a socialist country, somewhere between the west and USSR. Their citizens enjoyed great comfort based on the clever balance between the two sides. It may not have been Communist, but better scholars than you or I, disagree over whether Yugoslavia was in fact Socialist. In any case, large variations in “comfort” existed in the different Republics. The difference in comfort was stark between, say Macedonia and Slovenia. And even then, for the last chunk of Yugoslavia’s existence, it was all extreme inflation, high unemployment, power shortages, and large percentage of the work-force working abroad due to the lack of opportunities in Yugoslavia. And maybe the “comfort” was all due to the external debt that spiralled out of control, meaning the “clever balance” was not so clever after-all? They did build some extremely cool buildings though. There is no sign of nomenclature “communist architecture” or something like that. It is known as “mundialist architecture”as a form of art, and it is not only present in ex-communist countries though. Yes, it’s a funny old world we live in, I know. Nice article. But “communist” architecture in Belgrade is not limited just to Novi Beograd. There are plenty other neighborhoods in Belgrade you should also visit like Banjica, Vidikovac, Konjarnik or Mirijevo. I live in the municipality of Cerak which is a late 1970’s project that envisaged that cars should be left on the outside of the block and the in block communication was planned solely on foot or bicycles, so all the parking space was built on the outter perimeter. It was a very humane, quiet, green and peaceful community untill residents started building parking places between the buildings on their own during the 1990’s. As for New Belgrade, people not living there always considered it as Belgrade dormitory, which in truth it was untill the first decade of the XXI century when they built several larger malls with multiplex cinemas and foreign companies and banks built their HQ’s there. The big sport’s arena and several new modern glass and steel hotels complete this new image. Now it is a modern bussiness part of Belgrade mixed with appartment buildings and schools. Thank you Miroslav. Since this article was written, I’ve spent probably close to six months living in Belgrade, and have got to know many parts of the city. However, I haven’t seen Cerak (yet). Belgrade has become without doubt my favourite city in Europe, and I plan on returning again early in 2015. I don’t think I can ever stay away from Belgrade, or Serbia. Thank you Milos. Since this article was written, I have spent many months in Belgrade and Serbia. I have seen all of the buildings/structures you have suggested, but I’m sure there are more! Photo “The heart of Block 23” – features school I went to as kid. 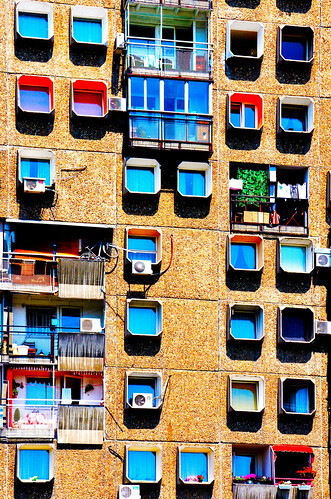 Built in early 80’s, it was one of the more modern in Belgrade. It had gym hall, smaller gym hall and swimming pool. On lower part of photo are bocce field, built in late 80’s. There were lot of men from adriatic parts of Yugoslavia, and they played it a lot back then. Now it is played much less. Playground on the right is built few years ago, as part of community program to build playgrounds, before it was empty field. At the time there were two playgrounds in block 23, much more modest by modern standards, and their remains can still be seen today. Main problem with Novi Beograd is poor maintenance in previous decades. Original architectural plan put lot of free space for new construction, and is still holding on. Pitty you didn’t visit Federation palace. It is still in same state as when it was built some 50 years ago, and still looks monumental, with nice modern art murals. Hey Milos – I never really escaped the Balkans, and I’m due for a trip back to Beograd soon. I will check out Federation Palace, and get some photos. Thanks for your comment, I really appreciate hearing from people who know the area so well. hey! In which mounth did you visit Belgrad?? I’ve visited many times, at different times of the year. One of my favourite cities on the planet. I like that wather and how it looks. Planing to visit Belgrad in late foll. Best guess – winter, probably January. Winter (IMHO) is when Belgrade looks best. Enjoy. Hi Nate – great photos! Next time you’re in Belgrade you might like to check out the Banjica neighbourhood if you haven’t yet. I have family there and the neighbourhood is home to many of these types of buildings. It’s amazing how warm and comfortable the apartments can be on the inside compared to what they look like outside. Also, you may like to read a bit about Tito, Yugoslavia’s old leader during the communist/socialist era. He was very loved, and kept the country together – they were happy days in Yugoslavia. Hi Sara, thanks for the tip – I did visit Banjica just once (last stop on the bus line), but didn’t get to spend much time, and it was dark not long after I arrived. I made a note to return, the buildings looked great, and the neighbourhood had a lovely feeling. I still come though Belgrade every now and then, but sadly it’s been almost two years since my last visit. Also – I have now spent enough time in Belgrade/Serbia/exYU to know that Tito was almost universally loved, and most people old enough to remember preferred the “socialist” life under Tito than what there is today. Cheers! Hey Nate, I don’t know if you are aware of this, but there is a neighborhood in Beograd (Medakovic 3) which has that communist style to it, but is more colorful, less depressing, and seems to be an attempt to make a more “bright and encouraging” environment. yup- you’d have to have lived there! I did…for 28 years until 3 years ago. I am an American without any Serbian roots. It was “communism” that created the lack of outdoor beauty surrounding these fabulous buildings. You see – if you cannot own anything (like the communists) then you only care about what is yours (i.e. the inside where you live). So when they put up a playground it quickly deteriorates & someone steals the wood. When someone breaks a beer bottle the glass remains right there where everyone walks. When you have to pee – you do so on any corner. And no one takes (literally no-one) takes care to see that grass gets cut, flowers are put in, bushes trimmed or deteriorating sidewalks kept safe. If you can’t own anything (like the communists), then you do whatever it takes to get what you need for yourself (like the communists). So corruption takes over. When corruption rules – then the mini-mafia types get everything!… for example the stores and coffee houses downstairs in many of the buildings. They take all the required residential communal money for their own pockets (a recent event in Blok 23 which you photographed) and bully anyone else from starting a business there. If you can’t own anything (like the communists), then the elevators break and no one is responsible to fix them. No one will come to fix them. No one will keep them clean. No one will be responsible to find a person to fix them. Think about the architecture you photographed and tell me which floor you’d survive on when the elevator breaks and it takes approximately 1.5 years to get it repaired (as recently happened to my friend who lives on the 10th floor. If you can’t own anything (like the communists) oh dear God don’t even think about calling an ambulance because it takes about 1 hour to get there no matter which floor you’re on. That’s due to the wonderful (used to be free) medical system the communists were so proud of. Then you must be quite well off to pay (not the hospital rather the doctor) when no one is looking. You’d better grease the palms of the nurses too or they might ignore your family member. And you will need to bring them all their food as the hospitals have none. Don’t forget to bring your own PJs – forget hospital gowns. I actually appreciated your post because I dearly love the people of Novi Beograd. I could write a book about how great they are. I just feel bad there will never be flowers put in or lighting that works to make the beauty of that place what it could be. Thanks for highlighting it. Lack of government is not impossible to achieve. Good luck in your upcoming clown-school exams.